If you can’t find the answer to your question here, you can try the search box over on the right. If that still doesn’t help, leaving a comment with your question (or hitting me up on Twitter) is the fastest way to get a response from me. You can also email me at anna@doorsixteen.com, but keep in mind that it may take me a while to reply to non-urgent emails. What’s your policy on advertising and affiliate linking? I accept a very limited number of sponsored posts, product giveaways, banner/sidebar ads, and other types of brand collaborations. I prefer to work directly with brands, and I am not under contract with any advertising network at this time. I do sometimes use affiliate links (generated by Sovrn and RewardStyle) in my posts, which means that if a product is purchased through that link, I receive a small commission. Those links have no influence whatsoever on the content of my blog, and are only added when available after a post has been written. I have a 100% transparency policy when it comes to my blog content—you never need to wonder if I am being compensated to write about something. If any content is sponsored or otherwise compensated, that fact will be made abundantly clear. Views expressed are my own opinion, and no one determines the content of my posts but me. I am very good at saying no. 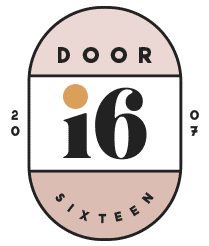 If you’re interested in advertising on Door Sixteen, please visit my sponsorship page for more information. Sure, but please don’t take the entire entry. Just take a photo or two, credit them clearly (the credit line can read “photo by Anna Dorfman” or “photo from Door Sixteen,” or something along those lines), and link back directly to the specific post (permalink) you took them from. To use a photo in print: You must contact me first. Chances are I’ll have no problem with it, but I need to know the context first. I am happy to provide higher-resolution, un-watermarked photos when appropriate. Keep in mind that I do not allow my photos to be used as visual reference for any product links that may be used to generate revenue. Please do not crop, alter, add graphics/text to, or otherwise alter any of my photographs. If you have a special request or need a certain size photo, please contact me. Will you add my site to your blogroll? I actually don’t have a public blogroll anymore. I’ve experimented with having “featured” links in the sidebar, but I worry that these kinds of things become popularity contests rather than ways to actually discover new blogs and interesting people. I think mentioning stuff I like contextually—like in blog posts—is a much better way for me to share links. This is just my personal preference. Can I link to your blog on my site? Of course! You can link to any site you want to. No need to ask permission! I own (and use) a lot of fonts. A large part of my job is researching fonts. I love fonts. I’m a font nerd. That said, I don’t really like to do font research for other people. I’m not trying to keep secrets or be a jerk or anything, but please understand if I don’t provide lists of font names. If you’d like to do your own font research, MyFonts is GREAT starting point. The post titles and headlines on Door Sixteen are set in Farnham, designed by Christian Schwartz. The body copy is Brandon Grotesque, designed by Hannes von Döhren. How do I become a book cover designer? Slightly longer answer: I’m probably not the best person to ask for career advice, but I did do a Q&A about my job a few years ago that you may find helpful. » Part One: How I Got Into It. » Part Two: How It Works. Can you review my portfolio and/or give me career advice? No, I’m sorry. Trust me, you don’t want my input anyway! What paint colors did you use in your house in Newburgh? Other than where noted, all of the paint was from Benjamin Moore. What paint colors did you use in your apartments? The apartments in DUMBO and Downtown Brooklyn were already painted white when we moved in. I have no idea what shades were used. How do you know how to do all this house stuff? The internet. If I don’t know how to do something, I Google it. Trial and error helps, too. We bought the house in Newburgh with zero knowledge of construction or any type of home improvement beyond painting (and we weren’t even doing that right). If I can do it, so can you. Really! Wait, I’m confused. Where do you live? From March 2006 until September 2015, my former husband and I owned a house in the City of Newburgh. Newburgh is about 60 miles north of New York City, on the west bank of the Hudson River. During that time, we also rented a series of apartments in Manhattan and Brooklyn (DUMBO, Cobble Hill, and Downtown Brooklyn). In October 2015, I moved from New York—where I’d lived for 40 years—to New Mexico. I lived briefly in a little town called Portales, then rented a 1939 Spanish revival bungalow in Albuquerque for a couple of years, and now I’m renovating a 1950 pueblo revival in Santa Fe. What kind of dogs are Fritz and Bruno? Fritz is a long-haired Chihuahua, and Bruno is a long-haired Chihuahua/Bichon Frisé mix. In August 2011, I did an interview about them for Dog Milk. If you ever wanted to know more about Fritz and Bruno, there you go! When I’m in New York, I go to Danielle Peters at Little Lion in Brooklyn. I wholeheartedly recommend her. If you go, tell Danielle I sent you! In Santa Fe, I get my cuts and color done by Antoinette at Style Labb. Antoinette rules! Tell her I sent you, too.